Think about Anthony Scaramucci, Jay Carney, Sean Spicer, Dana Perino, Josh Earnest or even Sarah Huckabee Sanders… if you don’t think a rock solid or fumbling mess of a press shop can help or hurt an elected official — you’re wrong. After all, political communications isn’t a job for the faint of heart. The hours are long. The stress is high and the demands, internally and externally, can be taxing. Anyone can do it but few can do it well. It’s a skill set that most experts agree can’t be taught. Yes, you can teach someone to write a press release announcing a new manufacturing plant, or giving mundane jobs statistics — some, though clearly not all, can even reply to simple media inquiries with facts, figures and relevant quotes — but shaping the direction of an official message, is far more nuanced and complicated. Perhaps that’s why when Governor Kay Ivey transitioned to governor she brought in a team of political experts to supplement her internal team. Despite what one would hope is the best efforts of Ivey’s team, sometimes things simply haven’t seemed to staff and management at Alabama Today, to transition well. At times Ivey’s office has been unable fulfill simple requests in a timely manner including some that Bentley’s team accomplished with seemingly little effort. On Thursday, Jan. 4, 2018 Alabama Today first reached out Daniel Sparkman in the Governor’s office looking for a list of Ivey’s appointments since she took office, as well as a list of top agency heads she had replaced from the Bentley administration. On January 23, we finally received the latter list. We’re still waiting on the list of appointments. Why the delay? Ivey’s press secretary says that the appointments office does not keep records the way that Bentley’s did. He insists no list of their more than 400+ appointments exists. That the answer to who she has appointed to date lies within a stack (though it’s not clear if that’s digital or printed) of appointment letters. Another request for those letters was met this week with a form to fill out. That request hasn’t been the only challenge encountered recently. As described in an earlier piece today, Alabama Today was briefly on an email list receiving the governor’s schedule and then we weren’t. No explanation available. 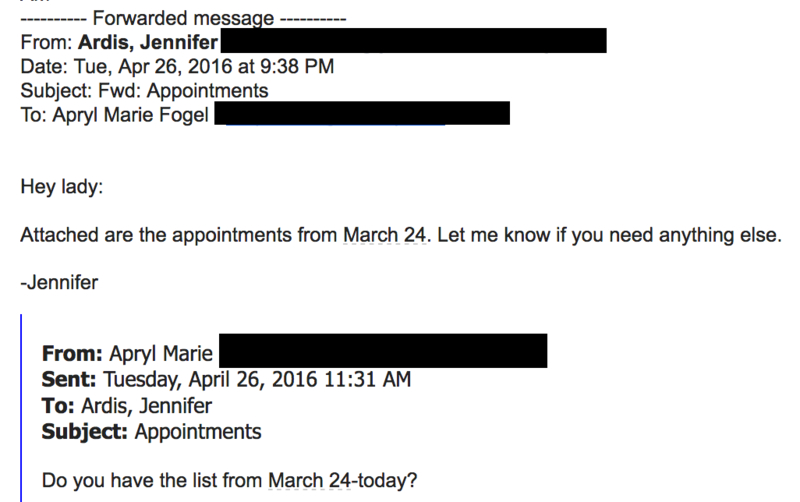 Then we received conflicting information on the intended transparency levels of details in said email. Perhaps the novice of her team is why Ivey insisted on having outside help when she took over the governor’s office. Sometimes in the politics, when you find yourself in crises situations — say when you take over the state following the resignation of the previous governor amid a growing scandal — you need to hire outside messaging help to supplement the efforts and abilities of your own team. Which is exactly what Ivey did last April. In June 2017, she re-upped Buchanan’s contract for $6,500-a-month to help get her messages out, but ultimately ended his contract on July 31, 2017. Ivey formally announced she was running for Governor on September 7, 2017. On Aug. 22, 2017, her office notified Buchanan they had overpaid him, which his firm remitted back to the Governor’s office. Buchanan has since transitioned to working as the senior advisor to Ivey’s re-election campaign. Ivey contracted Buchanan’s firm, in Sept. 2017 according to the Sept. 1 – Sept. 30 campaign finance reports. He’s been working on the campaign ever since. So who does that leave in Ivey’s communications shop? A little over a week after Ivey took office, she appointed Josh Pendergrass, a lawyer and pastor, to be her Communications Director. He holds a Bachelor’s Degree from Lambuth University and a Juris Doctor degree from Thomas Goode Jones School of Law at Faulkner University. Prior to working with Ivey, he had been in private law practice since 2011 and had served as the Senior Pastor at Bethany Baptist Church in Crane Hill, Ala. since 2013. He has also worked on several legislative and statewide campaigns in both Alabama and Tennessee. Daniel Sparkman | Press Secretary – Promoted to replace original press secretary Eileen Jones who was reportedly fired. One of just a few Bentley staff holdovers in the executive office of the Governor. According to his LinkedIn profile: Daniel Sparkman began his professional career in Oct. 2003 as a Production Technician with WFSA 12. He then went on to learn many of the jobs in production and some in news, before he found the opportunity for advancement and moved to KHOG/KHBS in Fayetteville, Ark. as a Photojournalist in Dec. 2004. Sparkman worked there for seven months before taking a hiatus from television to work as a banker. He returned to the news in March 2006 where he stayed for nearly eight and a half years until he joined former Gov. Robert Bentley‘s team as the Digital Media Coordinator in June 2014. In July 2016, Bentley reappointed Sparkman to Deputy Press Secretary and Director of Digital Media, where he worked closely with the Communications Director to ensure all media inquiries receive appropriate and timely responses, and continued to be responsible for overseeing all digital aspects of the Governor’s Press Office. He was reappointed to the same position in April 2017 by Gov. Kay Ivey, who brought in her own communications staff upon taking office. We have asked the governor’s office if she intends to replace Brent Buchanan and his company with additional support staff for her current communications operation. We will update this story if/when we get a response. moment i am reading this great educational piece of writing here at my home.